I thoroughly enjoyed this biking excursion. I took I-96 to Milford Roead to get here, then took Milford Road North to General Motors Road, turned left (West) and then parked my vehicle in a small, dirty parking lot on the north side of GM Road about 1/8 mile West of Milford Road. From here, you can bike to Hubbell Pond and the Dam. From there, you can bike on a nice paved path north past Hubbell Pond to Commerce Road, then turn right (East) on Commerce Road to Milford Road and bike through downtown Milford South, passing all the local shops, then passing Milford Central Park, until you get to West Huron Street, where you will turn right (West) which will take you back to GM Road which will lead you back to the parking lot. It's a very nice trip. This is a map of of the area biked in Photo Galleries 1 and 2. This map has a blue overlay of the path biked. 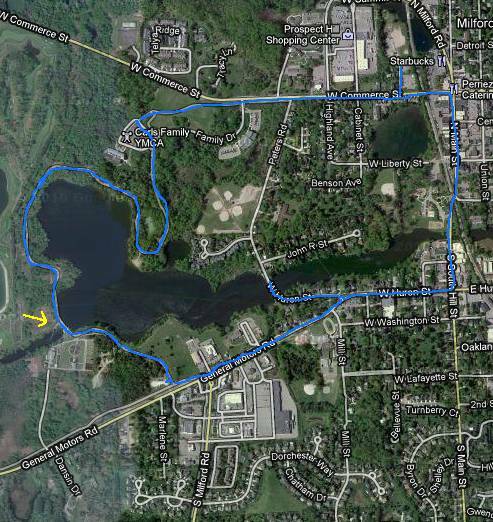 The yellow arrow points to the dam where two people sadly drowned the day after I kayaked the river upstream about 1.5 miles (see Proud Lake/ Kensginton Lake Kayak Gallery) and the day before I biked the path in the map.